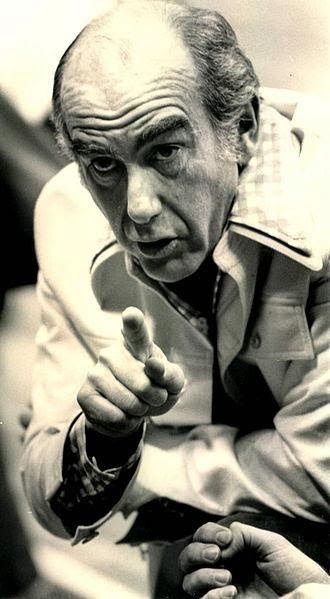 Jack Ramsay, the longest tenured coach in the history of the Portland Trail Blazers and who led the team to its only championship in 1977, died last week after a long struggle with cancer. He was 89. What a loss, and what a shock to learn that cancer finally had beaten Ramsay because he always struck me as some kind of early devotee of living the right way, always looking as fit and trim as the players he coached. I’ll always remember Ramsay, too, for his plaid pants, the kind of pants you couldn’t wear today without someone making a crack comment, but that he seemed to wear without a second thought. It was the 1970s, of course, although I don’t remember many other coaches who looked quite like Ramsay did. And I doubt his sense of style generated a run on plaid or paisley pants. But I had to have a pair, my mother or some family member finally getting me some plaid pants to wear and root on the Blazers, including the year the team put it all together in spring ’77. There’s nothing quite like following and believing in YOUR TEAM as they march their way through the playoffs to make the finals. But the Philadelphia 76ers were no pushovers. They had some guy named Dr. J and another nicknamed Chocolate Thunder, not to mention George McGinnis, Caldwell Jones, Doug Collins and Henry Bibby. The Sixers were favorites in the series, but the Blazers countered with Bill Walton, The Enforcer, Lionel Hollins, Johnny Davis and lesser known players — to those outside of Portland — such as Bob Gross, Lloyd Neal and Dave Twardzik. And because it was MY TEAM, it was tough to watch the Blazers lose the first two games in the series, especially the second game because the team completely fell apart, including the ejections of both Maurice Lucas and Darryl Dawkins for fighting. Lucas popped Dawkins for messing with Bob Gross, and then Dawkins swung and missed, accidentally hitting teammate Doug Collins. But those two losses were quickly forgotten as the Blazers reeled off four straight wins and the championship was OURS. The Oregonian, my hometown paper, did a nice job with Ramsay’s obituary, getting the right reaction from former players, coaches and others who knew him, and including information about Ramsay that was new to me. Farewell, Jack Ramsay. We miss you already.